This was a hosted stay with MagicalVacationHomes.com, however, the content and opinions are my own. Our family traveled to Orlando twice this year. 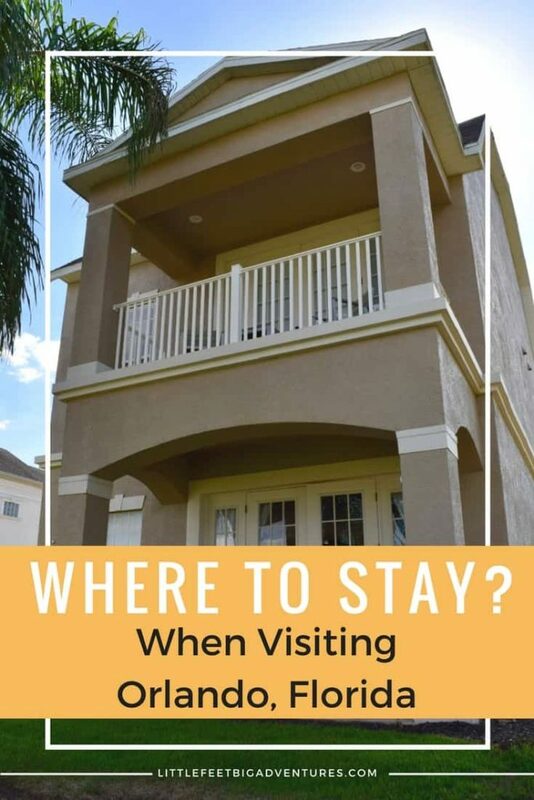 The number one question I always get asked is “where to stay in Orlando?”. With all of the options in the area, it’s no wonder that people want to know which accommodations are best for their family. 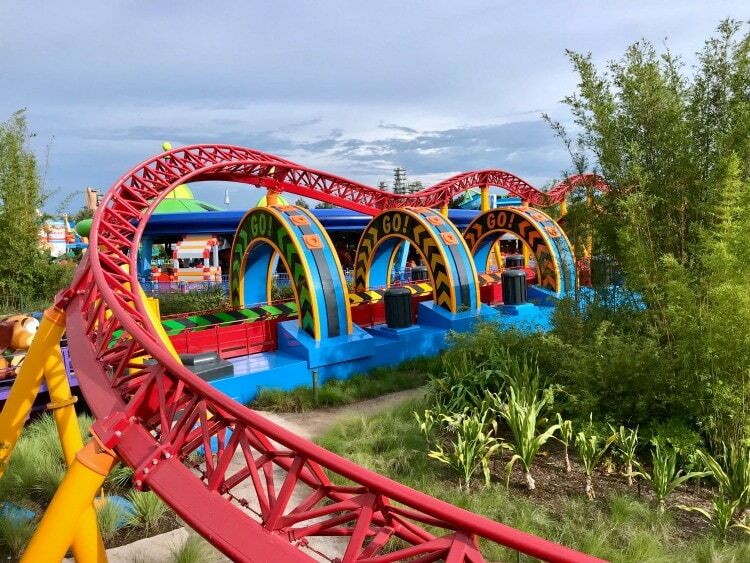 Many of those traveling to Orlando are heading to the largest Theme Park in the area, which of course, is Walt Disney World. There are options for staying on site at Disney but we have found a wonderful off-site option that’s both affordable and ideal for families. We were hosted by MagicalVacationHomes.com and stayed at one of their beautiful homes. They have homes available at three resorts and these properties are guess what…they are all located near Disney World! 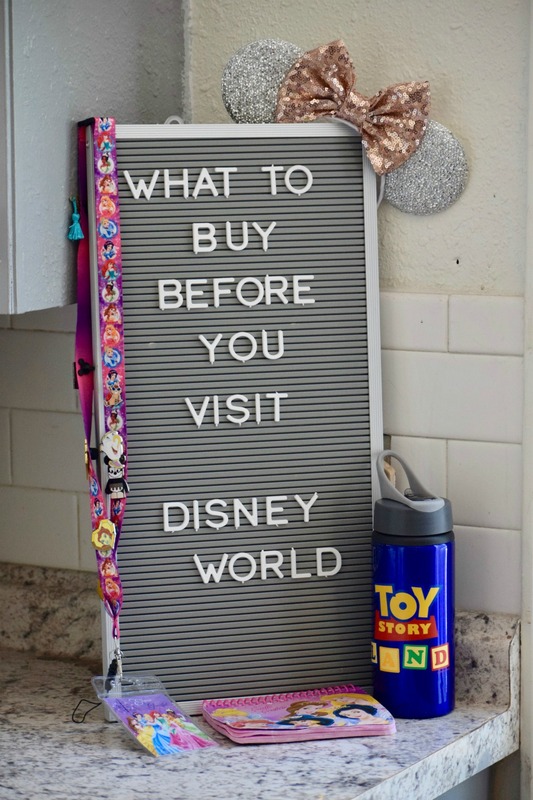 I’m sharing a full review of the home we staying in and explaining why I think you should book a vacation home on your next trip to Orlando. Groups of all sizes are traveling to Orlando. 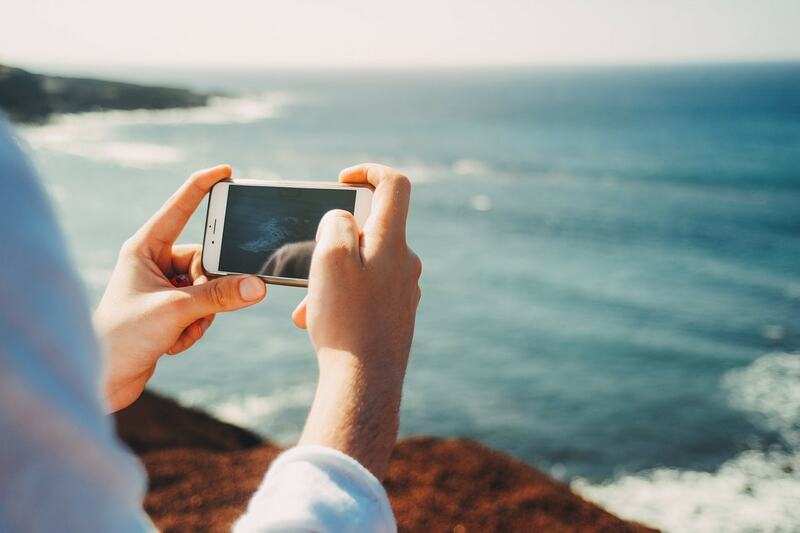 Couples enjoying a getaway, business travelers attending conferences, but most of the time families of all sizes are heading to the various attractions in the area. Next year we are planning a big multigenerational trip to Florida. The homes rented through MagicalVacationHomes.com com in all sizes. They have homes with 2-14 beds making it ideal for any size group. I was thrilled to find that they would be able to accommodate our group of 15+ that really prefers to stay together when we travel. On our recent trip we stayed in a 6 bedroom home that had plenty of space, no one felt crowed which allowed everyone to relax and enjoy their home away from home! The specific home we stayed at had 4 bedrooms in the main house and 2 bedrooms in the separate living area. The separate living area had its own kitchen with a sink, coffee maker, mini fridge, and a few other items that made it possible to stay out there without having to make trips back and forth to the main house. I’m sure if your family is like ours, you enjoying staying together but you also like your own personal space and some privacy. We loved that this was an option in the home we stayed in. After our 15-hour road trip to Orlando, the last thing I wanted to do was spend more time driving back and forth to Disney World or any other attractions in the area. MagicalVacationHomes.com has properties in 3 different Resorts in the area; Windsor Hills (2 miles from Disney), Reunion Resort (6 miles from Disney), Champions Gate Resort (12 miles from Disney). 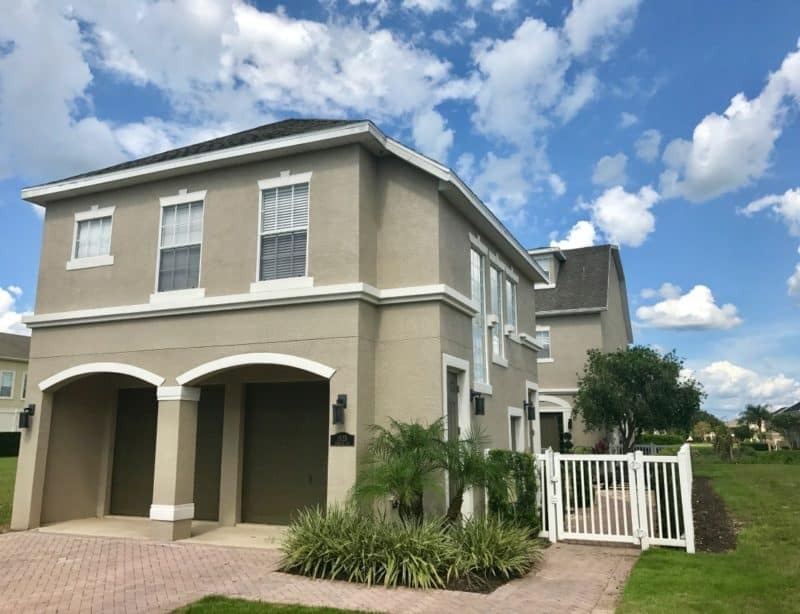 Our home was located at the Reunion Resort, we were only a couples miles away from shopping and food options that made it easy to do light grocery shopping during our visit without having to go far. Money Saving Tip: Staying in vacation homes allows you to cook your own meals and avoid the costly expense of eating out for every meal. When looking for a place for my family to stay, my number one concern is “it is kid-friendly”. 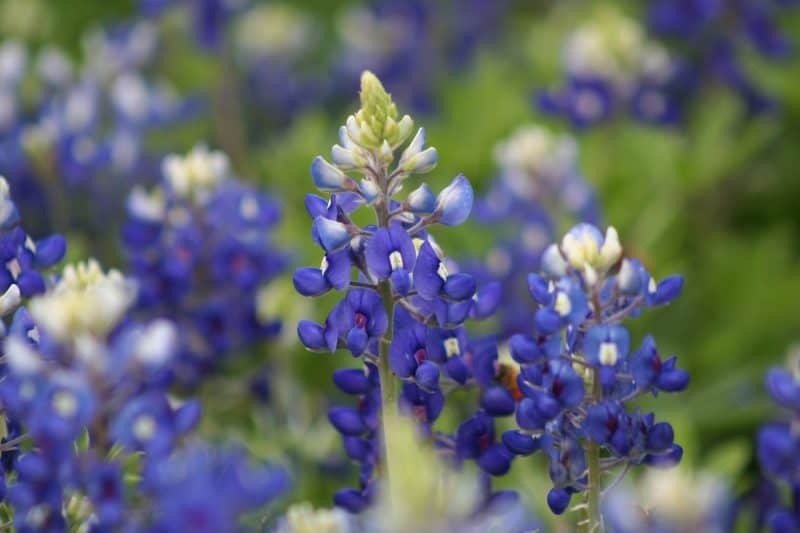 Parents know how important it is to find a place that you can enjoy being at with the kids. There is a level of anxiety that comes with bringing young kids to a place you have never been before. It’s not fun for kids or adults when no one can relax. 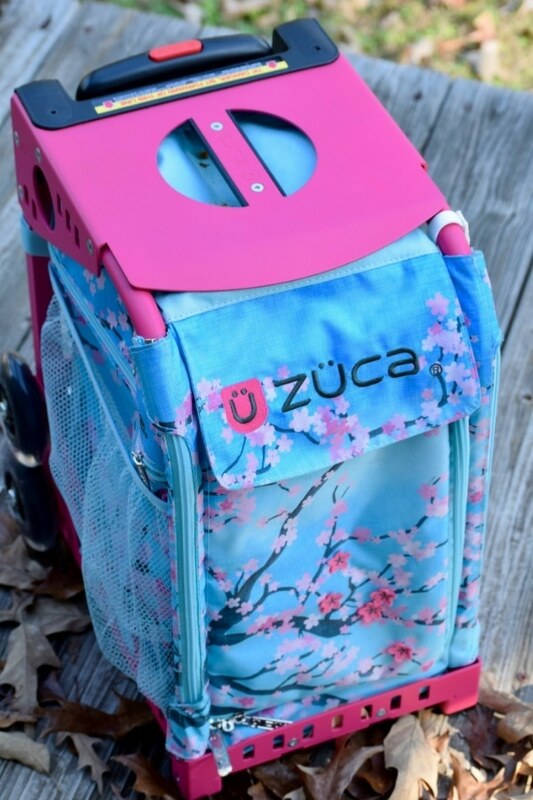 As parents, we fear that the kids are being too loud or that there won’t be enough to keep them entertained. 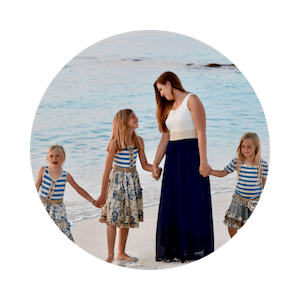 The homes rented through MagicalVacationHomes.com are designed with families in mind, this means you get the ultimate kid-friendly accommodations. The private pool was a huge hit with my kids. 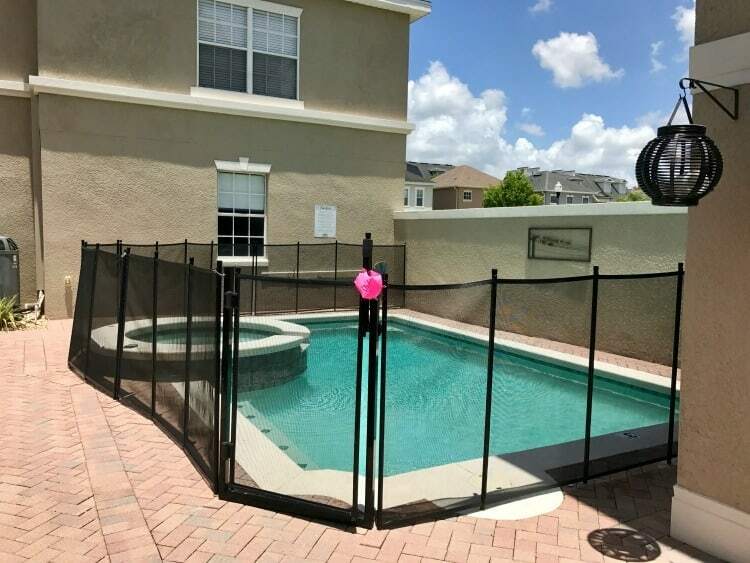 I can’t tell you how much I appreciated the pool safety fence. We have stayed in homes with pools before and I would constantly worry about my kid’s safety, but not in this home. The 1st and 2nd floor also had baby gates that could be used to keep young kids off the stairs, if you are a parent to young ones you know how amazing this safety feature is in a home. You can leave all your baby gear behind, the home we stayed in included a full crib, high chair, stroller, and more! Seriously, check out the game room! 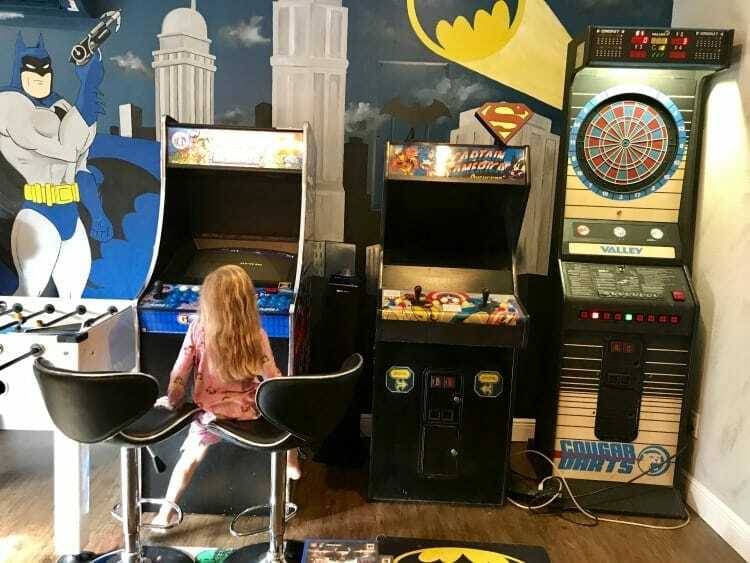 It comes loaded with a slate pool table, air hockey table, arcade dart board, foosball table, 70-Inch LED TV, Sony PS4, Arcade Legends – 120 Games, Marvel Arcade System, and Need for Speed Underground Driving Simulator. Who wouldn’t love that?! The movie room is the perfect place to spend some down-time with the family. 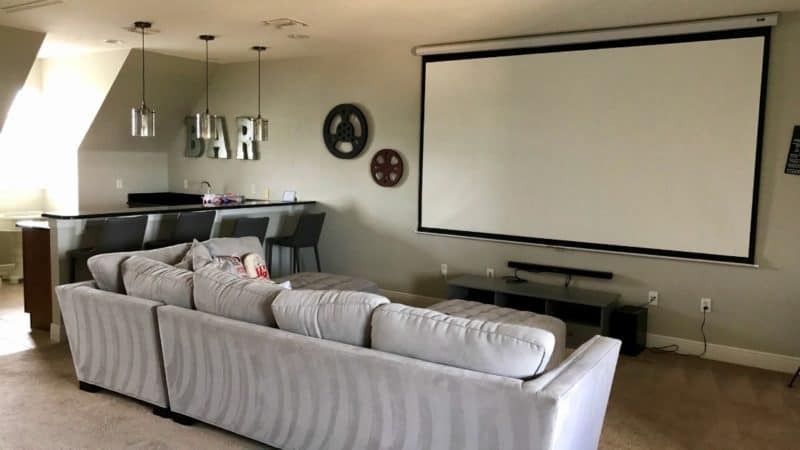 The third floor has been turned into a movie room with a 3D Movie Projector, SMART DVD/Blu-ray player, Apple TV 2, balcony with seating for 8, and a wet Bar. At night after the kids went to bed this was the perfect place for the adults to hang out without fear of waking the kids. 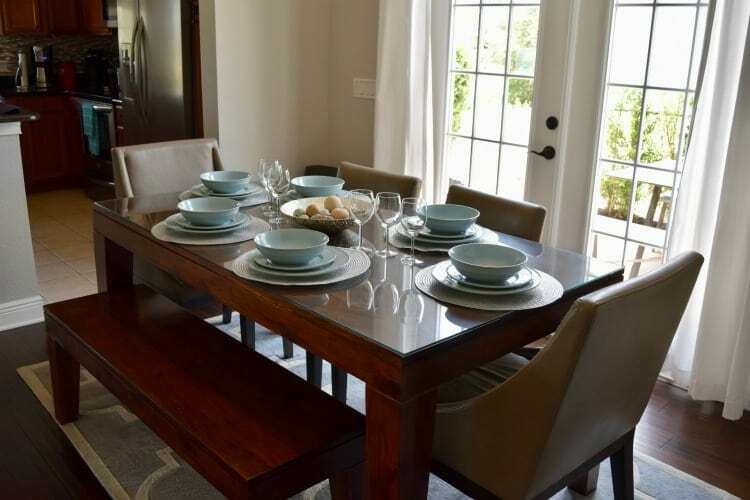 I thought this space was perfect for entertaining the family without having to leave home! Let’s take a minute to discuss the amazing kid rooms at this house. We had a Frozen themed room with bunks beds and a Train themed room that was loaded with small details that made these rooms come alive. What kid wouldn’t want to sleep in bunks beds made for little princesses or bunks beds inside a train? 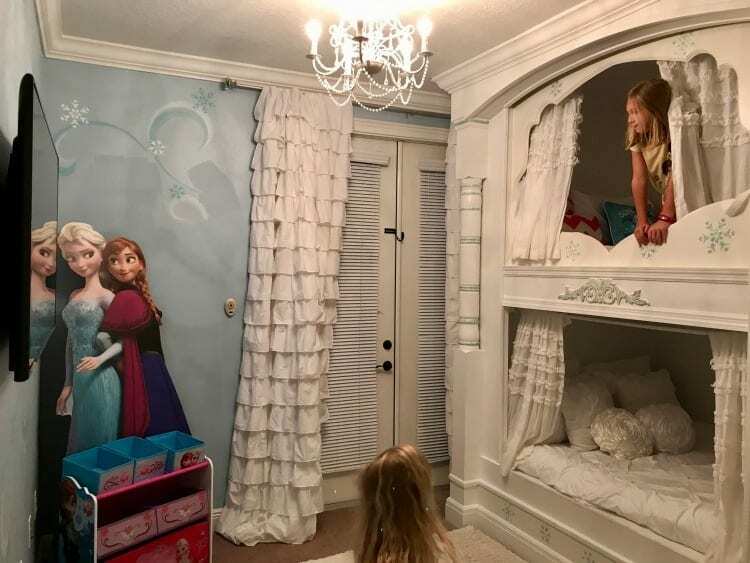 Our three little girls shrilled with excitement when they opened up the Olaf door to reveal the best-decorated kid’s room we have ever seen at any vacation home we have stayed at! The Reunion Resort, where our home was located, had 8 community pools, 6 dining options, a fitness center, bicycle rentals & walking trails, children’s activities, and a Resort Boutique Spa! You can also enjoy tennis courts, a private house guest pool and 3 Golf Courses (these amenities require house guest registration). 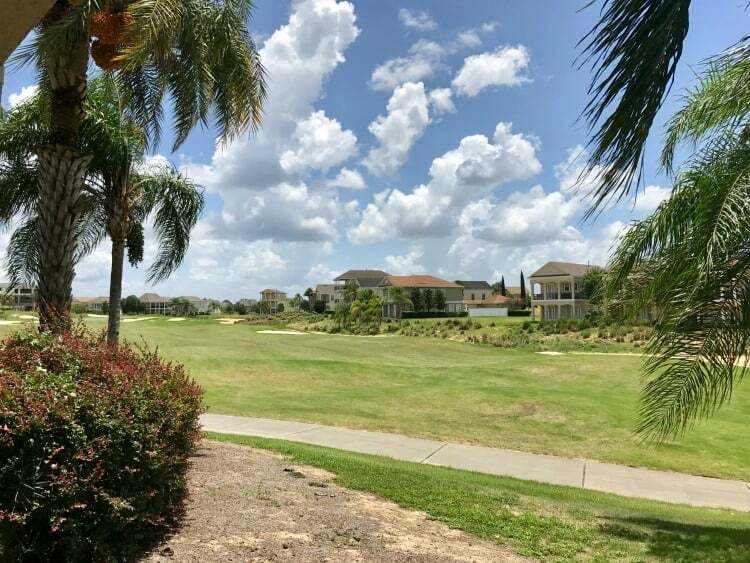 Our home was located right on the golf course and I must say it was wonderful waking up and drinking coffee while taking in the beautiful view. Don’t just take our word for it, check out the full tour by watching the video below! Renting a vacation home through MagicalVacationsHome.com comes highly recommended by our family! While in the Orlando area you must check out Pandora-World of Avatar!